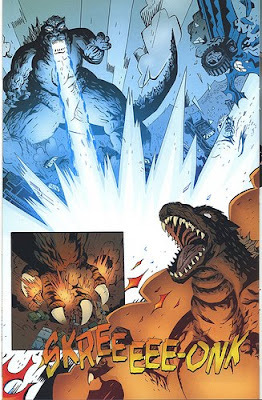 Page from Godzilla: Kingdom of Monsters #5 by Victor Santos. When the best of both worlds collide! I think long before I was a comic book fan, I was a little kid who loved Godzilla. Now with the help of Victor Santos, current penciller of IDW's Godzilla: Kingdom of Monsters series, I may soon have the opportunity to share a panel in the title! Nothing set in stone yet as to which issue, but Victor said he's working currently on issue #8 due out in October. SDCC News... Jamal Igle Receives Inkpot Award! WOW.. what a week of comics!